[GEORGE WASHINGTON]. Newspaper. Gazette of the United States, March 2, 1791. Philadelphia: John Fenno. 4 pp. (765-768), 10½ x 17 in. 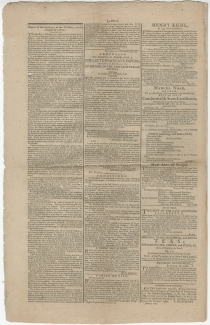 Includes full text of February 25 Act to Incorporate the Subscribers to the Bank of the United States. 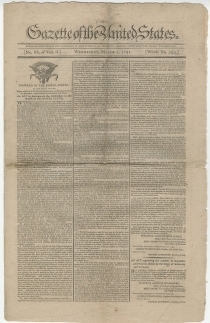 This foundational act is printed in full on the front page under an engraving of an early version of the Great Seal of the United States. It is signed in type by George Washington as President, John Adams as Vice President and President of the Senate, Frederick Augustus Muhlenberg as Speaker of the House, and Thomas Jefferson as Secretary of State. 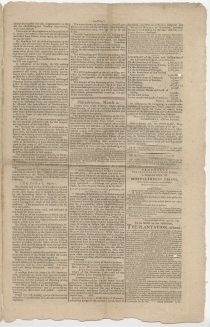 Other Content: Report on Senate’s reception of President Washington’s notice that he had signed the Bank Act, and note that “The bill supplemental to the act, making provision for the reduction of the public debt,” was engrossed and passed. (pp. 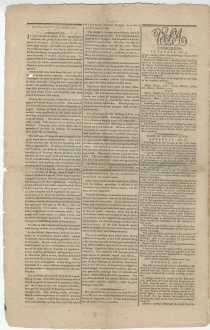 766-67); A Report from Treasury Secretary Alexander Hamilton on the creation of a mint is continued from a previous issue (and continued in a later issue); An Act regulating the number of Representatives for Kentucky and Vermont; a celebration of Washington’s birthday (“The Anniversary of the Birth Day of the President of the United States has been celebrated in all parts of the union, from which accounts have been received, with the highest testimonials of veneration and affection.…”); and an advertisement proposing the printing of a collection of state papers, which was endorsed by Jefferson.